Dogs usually love spending time outdoors, but most will appreciate having a nice dog house to keep them warm and dry when the weather sours. And while there are a lot of canine shelters on the market, there aren’t that many dog houses suitable for large breed dogs. But we’re here to help! We’ve curated a list comprised of the five best dog houses for large dogs below. 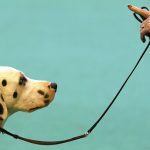 So, you should certainly be able to find one that is perfect for your pup below. We’ll even explain the types of things you want to look for when picking a dog house for your big dog and provide some advice for selecting the proper size too. The following five dog houses are among the best options for large dog owners. We’ve tried to include several different types of homes, which are priced at varying levels and suitable for different climates. About: The Suncast DH350 is an attractive large dog house that most owners would agree is pretty affordable. The Suncast DH350 features a relatively simple design, yet it still includes a lot of cute extras, such as the included lettering, which will allow you to add your pet’s name above the front door. Owner Reviews: Most owners were very happy with the Suncast DH350 Dog House, with several reporting that it provided great value for the price and that it was much sturdier than they’d expected. More than one owner mentioned that it was extremely easy to assemble and move around as necessary. One owner cautioned that it may be necessary to raise the dog house off the ground a few inches to prevent rain from entering, but this is easy to accomplish with a few bricks or pieces of lumber. Bottom Line: The Suncast DH350 Dog House is not the fanciest or most durable dog house on the market, but it is easily among the best choices for owners seeking budget-priced accommodations for their pet. It probably won’t hold up to a decade’s worth of use, but it should work well for several years while you figure out a better long-term solution. It is also important to note that, unlike some other large dog houses, which are too heavy to move easily, the Suncast DH350 should be easy to move around your backyard. It would also be a good option for owners who plan on relocating in the near future. About: The Petsfit Dog House is a well-built and attractive large wooden dog house that comes with a number of helpful design features. And unlike many other wooden dog houses, which end up being difficult for owners to assemble, the Petsfit Dog House comes with pre-drilled screw holes to make assembly a breeze. Owner Reviews: The Petsfit Dog House received very positive reviews from most owners who purchased it for their dog. Many owners reported that it is, in fact, very easy to assemble (although a few owners mentioned that the roof hinges were a little tricky to install) and that it is also as attractive as they’d hoped. More than one owner did complain that the cedar planks were a bit on the thin side, but that’s a relatively minor concern. If you live in a cold region and worry that the house won’t keep your dog warm, just purchase an insulation kit, and your dog should remain perfectly comfortable. Bottom Line: The Petsfit Dog House is a high-quality product that is very reasonably priced for the value it provides. The cedar planks used in the house’s construction should repel bugs and resist moisture damage, and they also look great too. The combination of the included door flap and raised floor should help ensure your pet stays warm and dry – even in inclement weather. Although this large dog house is only recommended for dogs weighing up to 75 pounds, it is much roomier than some other dog houses, which are rated for even larger dogs. Additionally, several owners who purchased the house shared photos of relatively big dogs (including German Shepherds and Golden Retrievers) comfortably laying inside. About: The Petmate Indigo is an igloo-style dog house for large dogs that utilizes a unique design to help provide additional protection from snow, wind and rain. It also features an innovative roof ventilation system, which helps to ensure adequate airflow in the house. Owner Reviews: Most owners were very happy with the Petmate Indigo with MICROBAN. The plastic used in the construction received plenty of praise, and most owners reported that their dog remained very comfortable in both hot and cold weather. It also appears to be extremely easy to assemble. However, a few owners did note that the product has a relatively small door. So, while the interior may be large enough to accommodate dogs weighing 125 pounds, tall breeds may have trouble entering the house. Bottom Line: The Petmate Indigo is a premium big dog house that is extremely durable and well-designed. It pulls off the tricky task of insulating your dog from the harsh weather outside the house, while still providing plenty of ventilation. The house is also very easy to put together and move (it weighs only 29 pounds). The MICROBAN protection treatment is also a wonderful inclusion, as it’ll help keep your dog from breathing in bacteria-laden air, and it’ll help ensure the house looks good for years to come. The raised, moated floor and extended entryway also provide excellent protection from the rain, making this a great choice for owners living in rainy locations, such as the Pacific Northwest or Southeastern U.S.
About: The Precision Pet Log Cabin Dog House is a fantastic-looking product, which most owners would be proud to have in their backyard. But this is more than just a pretty dog house, as it is very well-built and comes with a number of features that’ll help keep your dog comfortable in bad weather. Owner Reviews: The Precision Pet Log Cabin Dog House didn’t work out well for all owners, but the majority did give it a positive rating. Most dogs seemed to love the house, and unlike some other models on the market, dogs didn’t appear reluctant to enter it – likely because of the layout and relatively large door opening. The majority of owners loved the aesthetics of the house and reported that it was fairly easy to assemble (although you will need a drill to do so). Most of those who were not satisfied with the product appeared to receive houses with one-off manufacturing flaws, rather than poor materials or design, and these types of problems can happen with any product. Bottom Line: If you want one of the best-looking dog houses on the market, you should definitely consider the Precision Pet Log Cabin Dog House. It is a very attractive dog house, which won’t be an eyesore in your backyard. It appears to work very well, it should keep your dog warm and dry, and it provides a comfortable place for your dog to hang out or sleep. This isn’t the biggest dog house on the market, but it seemed to accommodate a number of German Shepherds, Labs and Golden Retrievers, based on user-submitted photos. It does have one of the largest door openings of any dog house we reviewed, which may make it a great choice for owners of tall breeds. About: The Aspen PetBar 3 is a no-frills, affordable and functional dog house for large dogs. Designed for owners who want simple, easy-to-assemble and effective accommodations for their dog, the Aspen PetBarn 3 deserves serious consideration from those who need to provide a large dog with protection from the elements. Owner Reviews: Most of the owners who tried the PetBarn 3 were happy with their choice. Most reported that there were a few small problems with the dog house, but on balance, it provided great value for the price. Dogs appear to find it comfortable, and most entered the house and began using it without hesitation. Several owners did complain that the top and bottom halves of the dog house were difficult to snap together properly. However, many owners found that a little bit of glue or a few bolts alleviated this problem entirely. Bottom Line: The PetBarn 3 is not the fanciest or most feature-packed large dog houses on the market, but it is not intended to be. Instead, it is designed to be an effective and functional dog house, which is available for a very reasonable sum. Aside from the small problems some owners experienced with assembly, most found the product very effective (and dogs, for their part, appear to agree). If you live in an area with a moderate climate and need an affordable home for your pet, the PetBarn 3 deserves serious consideration. It probably isn’t large enough for gigantic breeds (the manufacturer recommends it for pets up to 90 pounds), but it should accommodate Labs, Huskies, and other breeds of similar size. Do All Dogs Need Dog Houses? While dog houses aren’t necessary for all dogs, most should be provided with one. This is especially true of dogs who spend a lot of time in the backyard. A dog house’s primary job is to shelter your dog from the elements. If the temperatures fall or it begins to rain, sleet or snow, your dog will need a dog house to ensure he stays comfortable. Bad weather will not only make most dogs miserable, but it can also even cause them to become sick. In exceptional cases, dogs can even die if not provided with a dog house. Dog houses can also help keep dogs cooler in the summer, as they provide a shaded place for your pet to hang out while the sun’s rays are beaming down. 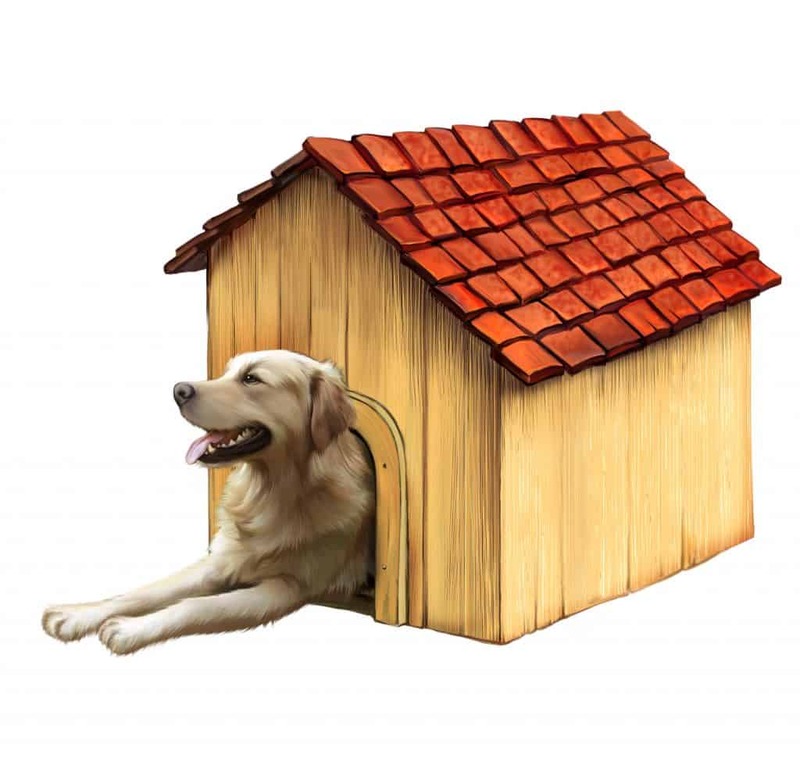 Some dog houses work better in warm climates than others, so be sure to pick a well-ventilated dog house if you live in an area with high temperatures. 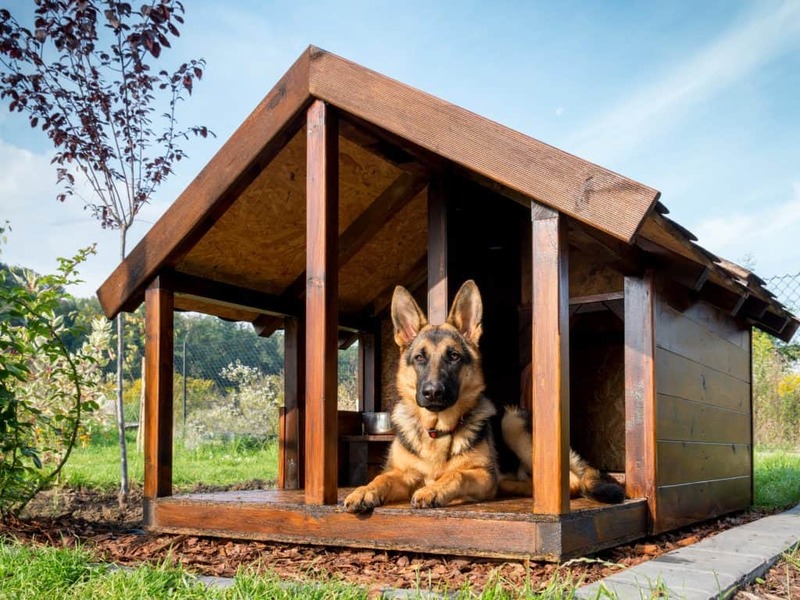 But while the primary purpose of a dog house is to provide shelter from the elements, dog houses also help support the mental and emotional well-being of your pet. By giving your pet a dog house, he gets to enjoy a sanctuary in which he can feel safe. This can help prevent problems like destructive chewing or digging. How Do You Pick a Good Dog House for Large Dogs? There are a variety of dog houses on the market, and it is important to select one that will suit your pet well. You can do so, in part, by considering the following things when making your choice. It is imperative that you consider the typical climate of your area when picking out a good dog house. If you live in the Deep South, you’ll want to make sure that you select a dog house that is well-ventilated, so that the inside of the dog house doesn’t become too hot. Conversely, dog owners living in New England should stick to insulated dog houses, which will keep your pet warm in the winter. It’s also important to consider things like precipitation when you start looking for a good dog house. If you live in the Pacific Northwest, for example, you’ll definitely want to stick to dog houses that are made from plastic or very well-sealed wood to combat the perpetual rain and moisture. On the other hand, this isn’t terribly important for owners living in the arid Southwest. Wind is also something to think about when making your selection. If you live in the Great Plains, you’ll want to be sure to select a house that is heavy or one that can be anchored to the ground. Where Will You Put the Dog House? It is also important to identify the exact space in which you plan to put your new dog house before you make your choice. For example, if you are planning on putting the dog house in a shaded spot in the backyard, it may be more important to find a dog house that will keep your dog sufficiently warm, rather than looking for one that will stay cool. The exact location of the dog house may also affect how much you have to worry about termites and insects too. For example, if you have a wooded area behind your home in which you’d like to place the dog house, you’ll probably want to opt for a plastic model, rather than one made from wood. You’ll want to consider the drainage patterns of your property too. If you plan on putting your dog’s house in a high-and-dry location, wood dog houses will work quite well, but if you want to situate it in a low-lying, occasionally damp portion of your property, you’ll be better served by selecting one made from plastic. If you’re reading this article, you probably have a pretty large dog, so you’ll obviously need a house big enough to accommodate him. We’ll talk about the best way to determine the proper dog house size for your pet in a moment, but just know that this will need to be one of your primary considerations. 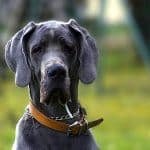 After all, it can be difficult to find dog houses that are large enough for Great Danes, Mastiffs and other gigantic breeds. Once you’ve thought about the considerations discussed above, it is time to start whittling down your potential selections. The best way to do this is by thinking about the features and characteristics you want in your dog’s new house. Dog houses are typically made of wood or plastic. Neither material is inherently better than the other, but they both work best in different contexts. For example, plastic dog houses are typically lighter and easier to move around than those made from wood. They’re often well-insulated, and they typically come pre-assembled or require only minimal effort to set up. Many plastic dog houses also contain internal voids, which help to moderate the temperatures inside the house. Wood houses also offer several key benefits. For starters, most owners prefer the way wooden dog houses look. Additionally, you can paint most wooden dog houses so that they’ll match your own home. It is also important to note that it is easier to mount things – such as tethers or elevated water dishes — on wooden dog houses than it is plastic dog houses. All dog houses require ventilation to ensure your dog can enjoy breathing in fresh, clean air. However, ventilation is especially important for those living in damp or hot climates. Conversely, if you live in a cold region, you’ll want to avoid purchasing a dog house with excessive amounts of ventilation, as this will only make it more difficult for your pet to stay warm. The door will be the primary place in which air exchange between the interior and exterior of the house will occur, but some dog houses also feature windows or raised roofs, which also provide places where air-exchange can occur. Some high-end dog houses feature attached decks, porches, or balconies for your pet to enjoy. These types of features are certainly not necessary, but many dogs do enjoy these types of features. Note that some of these dog houses feature stairs, which provide access to elevated sections. These types of stairs occasionally intimidate dogs, so consider your dog’s confidence level with stairs and similar obstacles before laying out extra money for these features. You don’t want to spend a lot of money on a fancy dog house with a balcony if your pet won’t ever use it. Most dog houses feature a single door, but a few come equipped with a pair of doors. These types of dog houses not only work well for multiple pets (assuming the dog house is large enough to accommodate two dogs), they can also provide additional ventilation, which is sometimes advantageous. Unless you live in a cold region, there’s no reason to avoid houses with two doors, but they’re rarely necessary for houses intended for a single dog. If you live in an especially cold climate, you should look for a dog house that contains additional insulation. Different dog houses use different types of insulation; some simply include internal air spaces, while others feature foams, reflective films, and other insulating materials. 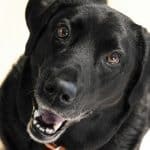 It can be difficult to make apples-to-apples comparisons between the various types of insulation used in these dog houses, so make sure you check out the experiences of other owners before making your choice. If you are ordering a large dog house, you’ll almost always have to assemble it yourself – they’re simply too large to ship fully assembled. But the degree of difficulty you’ll experience while doing so will vary significantly from one dog house to the next. Generally speaking, plastic dog houses are very easy to assemble and require no tools. Most feature two or three pieces, and you’ll simply need to snap them together. On the other hand, most wooden dog houses will require you to insert wood screws or other hardware to put them together. 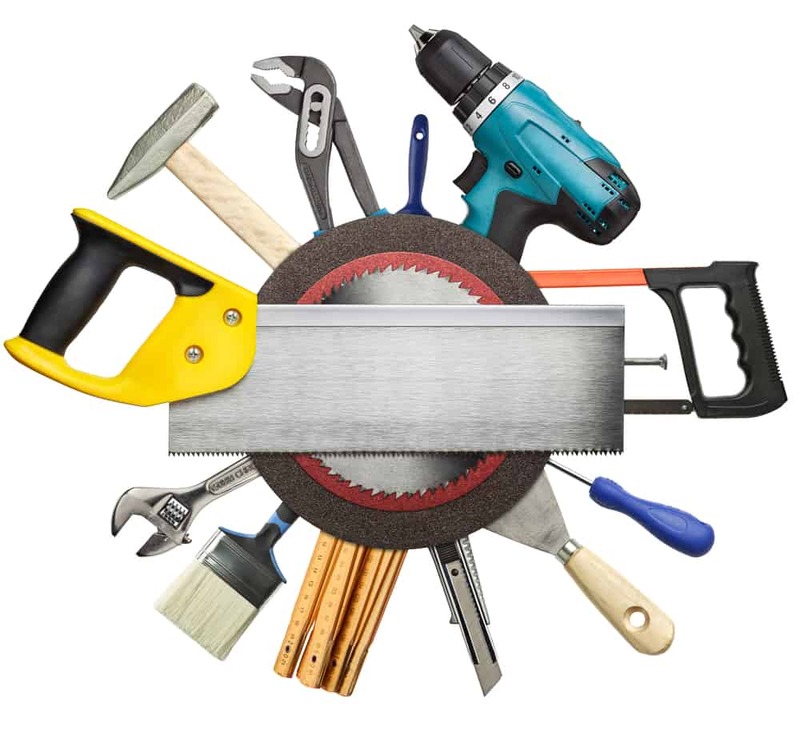 This means that you’ll likely need a cordless drill, and perhaps a few other tools as well. Be sure to carefully review the manufacturer’s information regarding assembly, as some wooden dog houses will require you to drill pilot holes before driving the screws, while others come with pre-drilled holes. Obviously, those that come with pre-drilled holes are much easier to assemble and more appropriate for owners who aren’t especially skilled using power tools. Your dog won’t care about the aesthetics of his home at all. 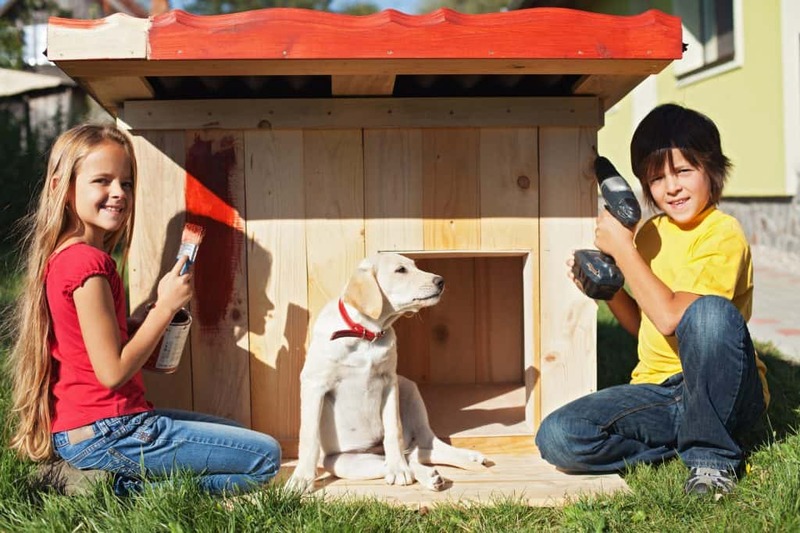 He’ll use the gaudiest dog house you can find just as enthusiastically as one with beautiful paint or stain, contrasting trim, and carved decorations. Some owners will also consider the aesthetics of a dog house to be only a minor concern. But in some cases, the appearance of a dog house is extremely important. Some owners will just want their dog’s house and property to look appealing, while others may be required to stick to only the best-looking dog houses to comply with local code enforcement or home owner’s association rules. Fortunately, there are plenty of options at both sides of the spectrum. There are a number of affordable dog houses which are functional, if not beautiful, and there are also plenty of dog houses that would look great in any backyard. Just be sure that you think about the aesthetics of your dog’s new house before making your choice. 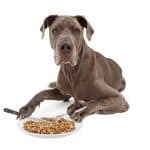 Size is an important issue to consider anytime you are selecting a dog house, and it is especially important to think about when trying to purchase a house for your large breed dog. Understand that dogs do not want or need a house of palatial proportions. Like most other animals, dogs usually prefer a relatively cozy space into which they can retreat. This helps them to feel safer. Nevertheless, you have to select a dog house that is large enough to accommodate your pet. 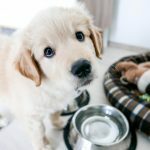 As a rule of thumb, you’ll want your dog’s house to be large enough that he can stand comfortably while inside and turn around completely (essentially, a dog’s house should be about the same size as his crate). You can typically arrive at a good estimate by measuring your dog’s nose-to-rump length and his paw-to-shoulder height. Add a few inches (2 to 4) to these figures, and you can determine the minimum internal dimensions he’ll need. In practice, door size is often the most important consideration, as the interior of most dog houses is larger than the door opening provided. The width of the door opening is usually not a limiting factor for most dogs; instead, it is usually the door opening’s height that can cause problems. 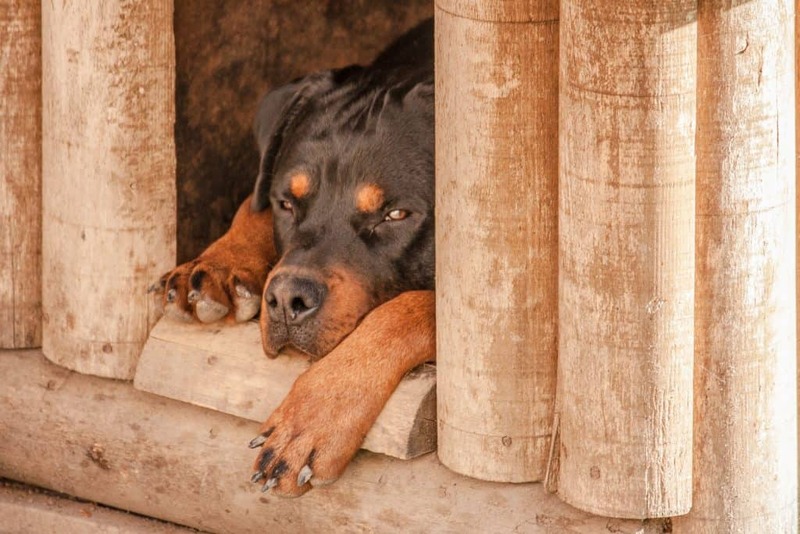 While dogs don’t usually mind crouching down a bit to enter their house, some may be reluctant to enter dog houses with especially small entrances. If you are in doubt, note the size of the door for the dog house you are considering, and then set up a similarly sized passageway for your dog (you can use things like cardboard boxes or couch cushions to design such an experiment). If you can entice your dog to move through the makeshift passageway, he’ll likely find the dog house’s entrance acceptable. Most dogs will lie down on the bare floor of a dog house, but they’ll be much more comfortable if you add a comfortable bedding. This will not only provide a bit of cushion to keep their elbows, knees and hips more comfortable, it will also keep them warmer during the winter too. There are a number of things you can use in such applications. 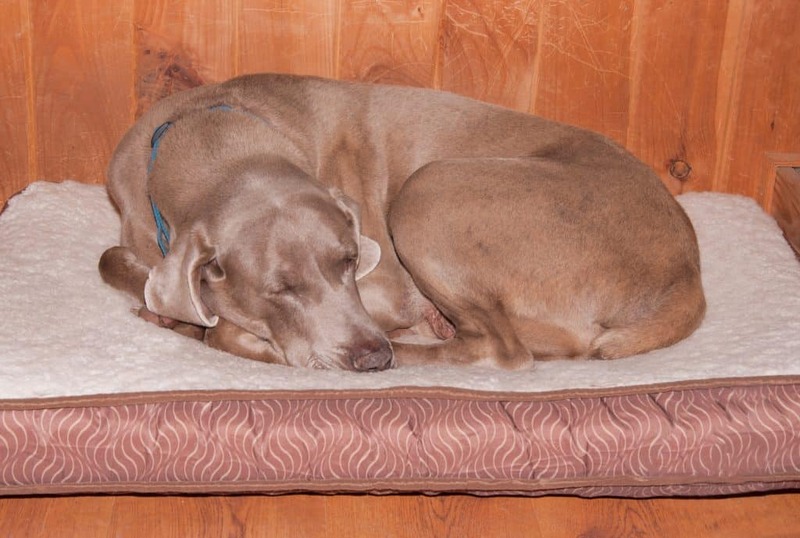 A memory-foam dog bed is the best possible choice, especially for large breeds, who often suffer from hip and joint problems over time. However, you’ll want to ensure you select one that is waterproof and durable enough for outdoor use (or, use a protective cover to keep the bed dry). However, you can also use old blankets or towels. Most owners will be able to find a few old linens that aren’t being used, and it is easy to wash these types of items to keep them clean. You can also use wood chips or pine straw, but avoid using hay with young puppies or pregnant moms, as this can cause the youngsters to become sick. Dog houses are important for keeping your pet safe and sheltered, and every dog who spends a lot of time outdoors should be provided with one. It is occasionally difficult for large dog owners to find a suitable dog house, but one of the five best dog houses for large dogs mentioned previously should fit the bill perfectly.